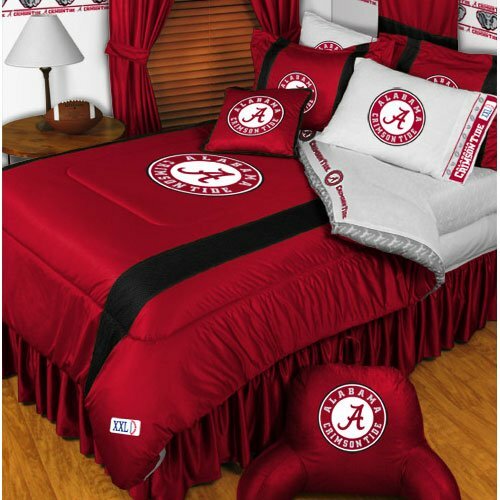 Pattern: NCAA Alabama Crimson Tide. Genuine licensed merchandise. Machine washable. One full/queen size comforter 86 x 86 inches (193 cm x 218 cm). One full flat bed sheet, finished size 81 x 96 inches (206 x 244 cm). One full fitted bed sheet. Two standard pillowcases (the white ones in the picture), each fit 20 x 26 inch (51 x 66 cm) pillows. If you have any questions about this product by Store51, contact us by completing and submitting the form below. If you are looking for a specif part number, please include it with your message.